The perfect sugar cookie, a good sugar cookie--hard to find isn't it? Well it's hard to recreate too. What is the perfect sugar cookie? Is it taste, texture, creaminess, the right amount of sugar to butter ratio? For me it's not being too sweet, with more butterness taste over sugar taste. What about you? What do you look for? We all have different likes, wants & needs in a sugar cookie. I love a light airy cookie with real buttery taste, crisp edges and just a hint of chewiness (a hint!). 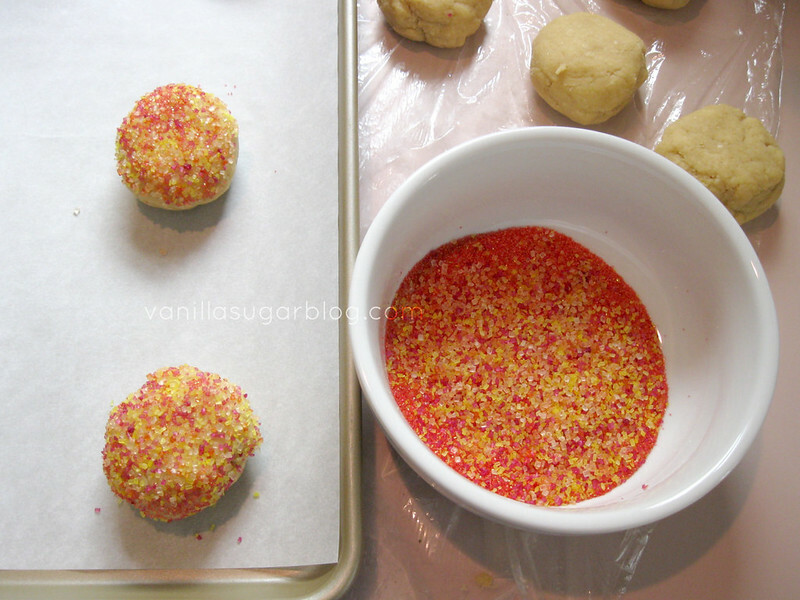 Need to have the right sugar sprinkles on my sugar cookies for texture and eye appeal. Some sprinkles really stink--too corn syrupy tasting or too chemically tasting. Who likes that? Not me. 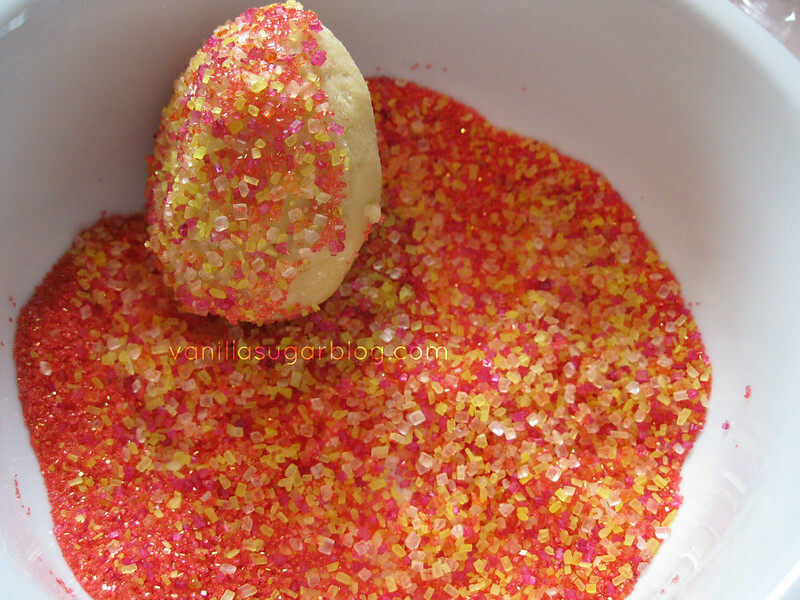 But I have found some really good sugar sprinkles made with pure sugar, no chemicals, and colored naturally. In of all place, my second home: Whole Foods. Yes indeed. They have the best sugar sprinkles. They are a bit pricey, but the flavor is spot on--what one would think a sugar sprinkle should taste and look like: like sugar and like big old chunks of glistening sugar crystals. No dyes, or chemicals either. Best part? 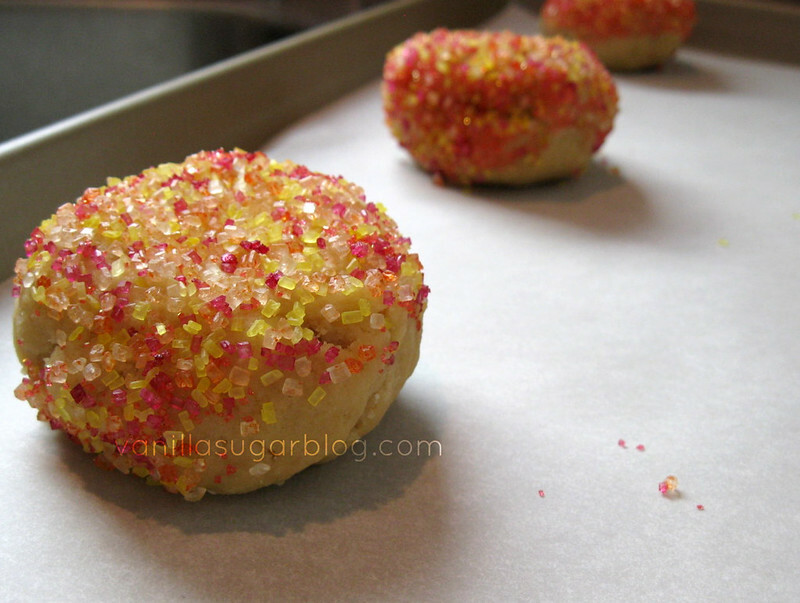 The sugar crystals stay crunchy "after" baking. A lot of good bakers look for that. So give these a go, you can find them at any Whole Foods in the baking section, next to the jimmies, in the same area as the extracts, herbs, and spices. This recipe, if you do make them try using the European butter. It's just a better grade of butter with a better flavor; a richer flavor of butter. So if you like light sugar cookie with a hint of chewiness, gentle crisp edges and incredible pure butter flavor, then give these a go. I promise you will love these. When I made these for friends they were not only gone in a matter of minutes but everyone wanted the recipe. That good! These are perfect for any Easter functions you have coming up; way better than store bought. In a bowl mix the flour, baking soda, baking powder and salt, set aside. In a mixing bowl, mix butter and both sugars until just mixed. It won’t be creamy because butter is so cold—that’s ok. Add the egg and vanilla, mix till just incorporated. Add in the dry to the wet and mix till just incorporated—never over mix. The dough should be a little dry. We want to mix as little as possible as we don’t want the butter to get too warm nor do we want gluten to start forming—this will give us a nice light, airy, crispy cookie. Place bowl in fridge to chill/firm up. At least an hour, longer if its warm weather. When ready to bake preheat oven to 375 degrees. You can divide dough how ever you like; I wanted large cookie so I made “almost” golfball sized balls and kept them round as they will spread when baking. Roll the balls in the sugar sprinkles on one side (or both if you desire). Place onto parchment lined cookie trays or non stick cookie trays. Do not press flat. Bake for 18-22 minutes—all depending on your oven. Look for almost golden brown edges. I got about 15-17 large cookies; if you make them smaller maybe you will get about 25-30 cookies, I don't know haven't made them small yet. 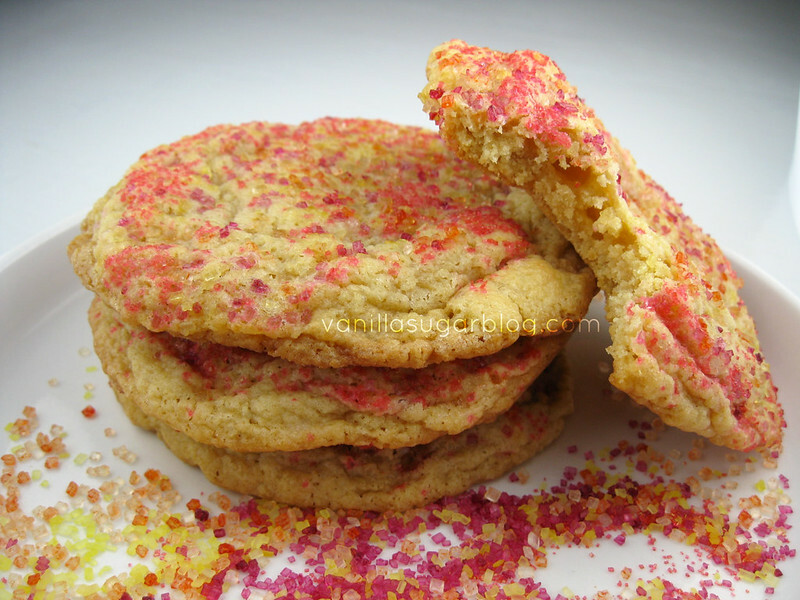 Cripsy with a hint of chewiness--these are my type of sugar cookies! Such pretty sugar crystals! Nice job perfecting your recipe! These sugar cookies sound good.. right about now! Realmente es maravillosa la galleta, tienen que ser una delicia. 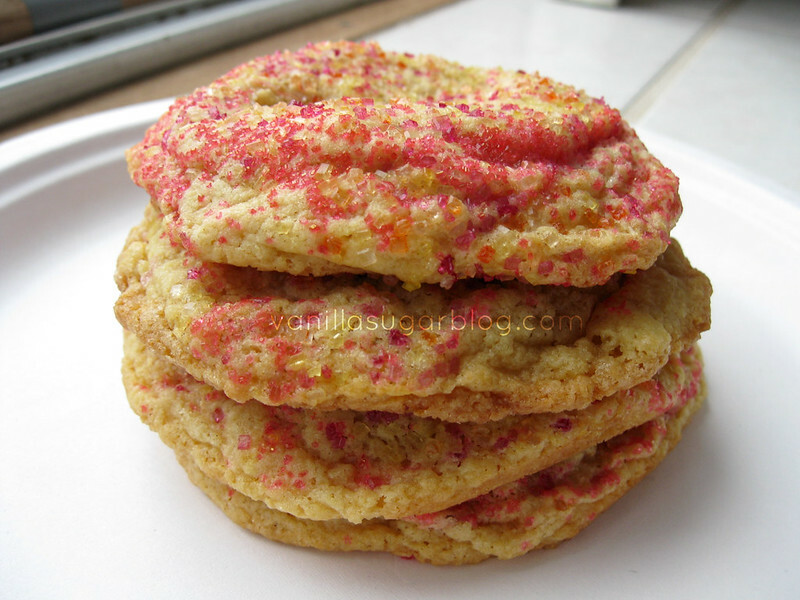 Who doesn't absolutely adore a good sugar cookie! They are up there as one of my favorites. I might have to bake them for a bit shorter cause I really love that chewy gooey center! I love my sugar cookies to be super thin, just a bit chewy, and super buttery. My mom makes them just to my liking, though this is usually unintentional as she likes them crisp and crunchy. 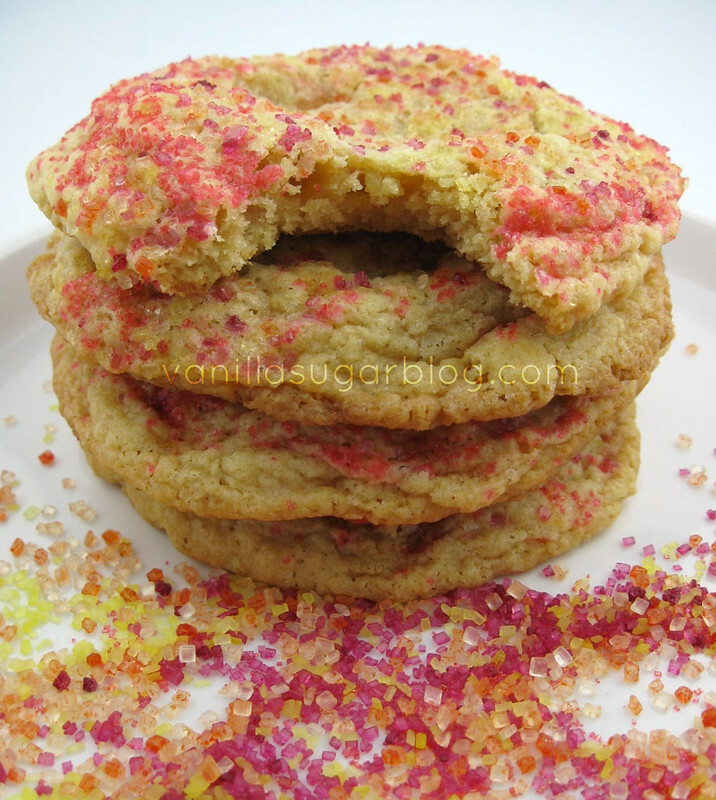 These ones look great - I love the colored sugars, especially since they're chemical-free! 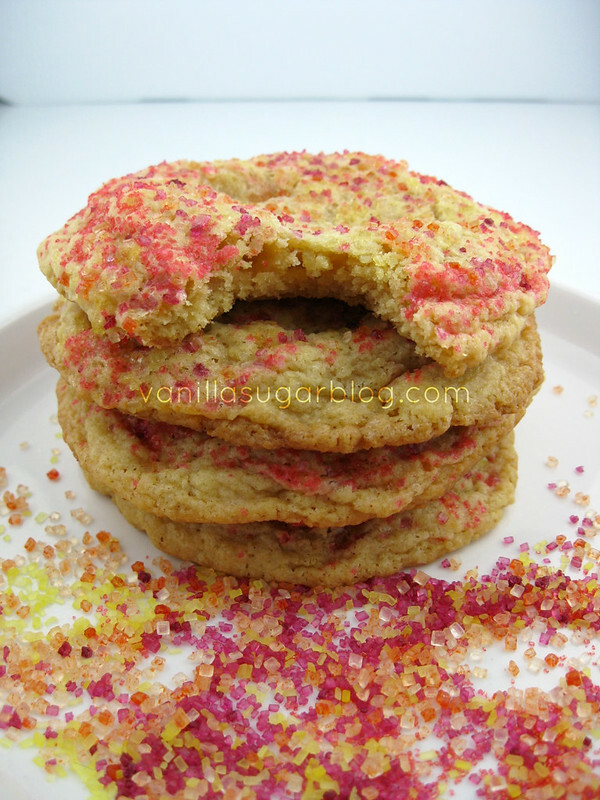 I love a good sugar cookie! I've seen the sugar at Whole Foods but never tried it- I'll have to change that! A perfect delight! Thanks for sharing. I am puzzled by the baking times. Why is there a longer baking time for the smaller cookies ? How do they look when they are done ? I don't want to overbake them. I plan on making the large-sized cookies. You are wished a rainbow-filled future ! ooh, crispy and hint of chew? awesome sugar crystals? i'm thinking those ship well... no? 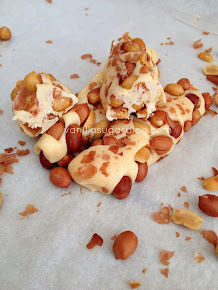 :) i'll keep this recipe in mind next time i have a craving! when I have said those exact same words they were arranged different - you have the perfect cookie sugar. Lovely, every time I may sugar cookies they come out a bit different. Probably because I have two little "helpers". The addition of the beautiful sugar crystals are a must and I agree about your source. Ooh. Thanks for sharing. I'm always looking for recipes like this. Bookmarking! Ohh you fancy using European butter. I love my Land O Lake..but I suppose I could get off my wallet and get some Mizz Fancy Pants butter(I love my Mizz Fancy Pants). I am totally digging those all natural sprinkles. I will have to keep an eye out for those. I like sugar cookies with lemon icing. yum! i'm going to whole foods this week for the first time! these look awesome, it really is hard to find the perfect cookie! Your cookies do look perfect. I'm bookmarking the recipe right now. Saw your tweet about this but had been inundated with so much good stuff on Twitter this morning, I had to step back and take a deep breath! 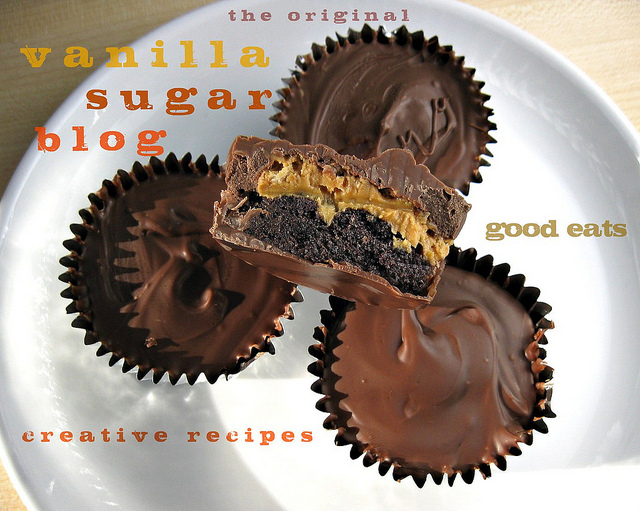 Now I'm back to let you know that I am so going to make these. Hubs loves sugar cookies and I have yet to find one that meets with his approval. This could be it...! Where was this post last week! I tried yet another sugar cookie and more disappointment. I am trying these as they look wonderful. Thanks for the butter tip! They really look so pretty and festive! Your friends must love you! 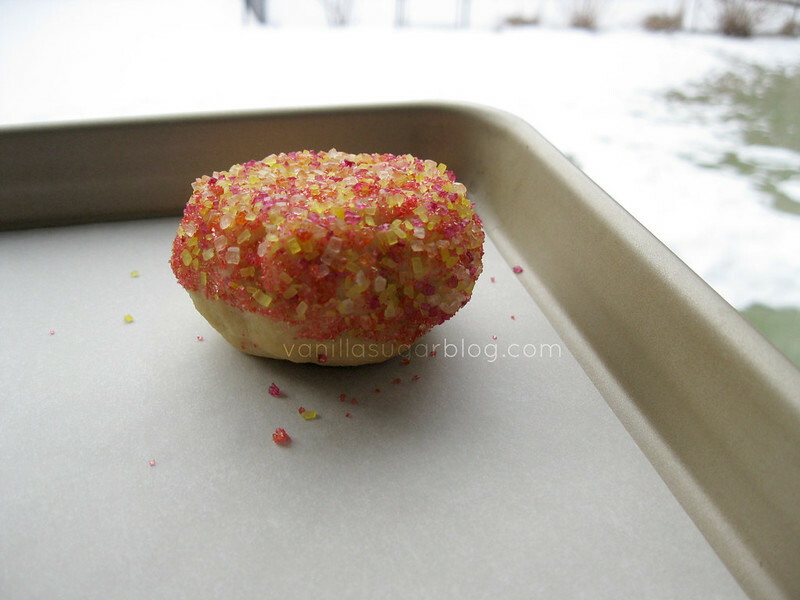 :) Love the sprinkles too - no chemicals! YAY! I had ton play catch up here...went all the way back to that pizza. OMG. An killer pizza if I ever saw one. And now, the perfect sugar cookie. That's the recipe to keep and then we can add whatever. 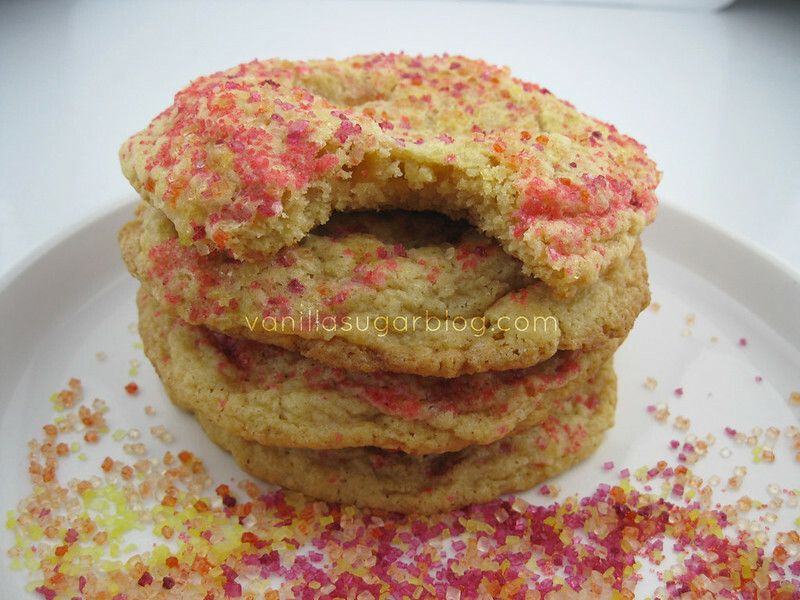 I've been looking for a sugar cookie recipe that was just perfect and I think this might be it! Thanks so much for sharing! Oh my - these really do look like perfect sugar cookies. And thanks for the reco on the Whole Foods sprinkles. I can't wait to try both cookies and sprinkles! 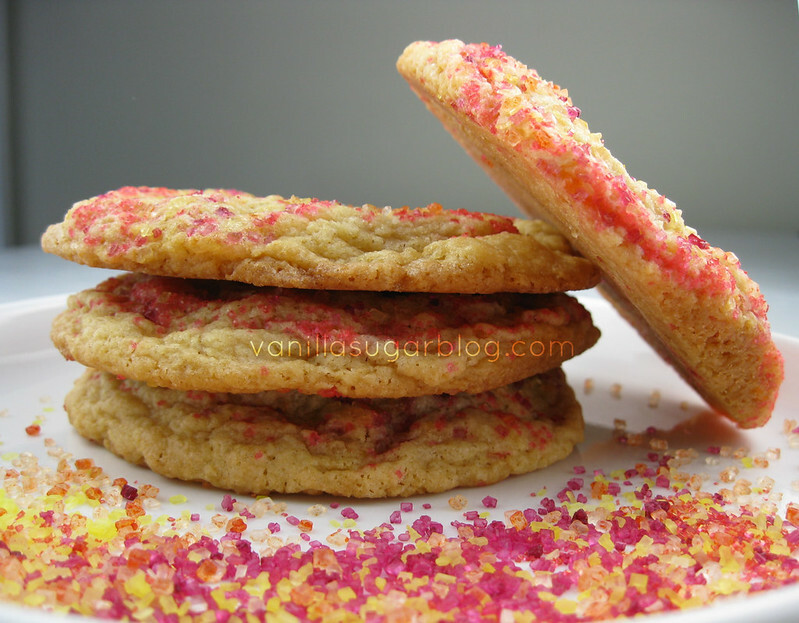 a good sugar cookie can be the perfect finish to a meal, the perfect snack, or heck, the perfect breakfast. i like your description of these! So pretty! hmm...sad to say, I've never had sugar cookie.. The photographer in your header... I don't know what else to say. 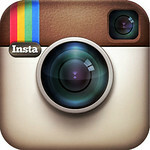 I am now going to search your blog for a brownie recipe. I suddenly feel like having something sweet and Val that is because of you! You and your blog do this to me. These are so pretty! I LOVE that you put the sugar on before baking them! This recipe looks great, I'll be trying it soon! In the oven now! Can't wait to try them out.